You could easily make the case that "quality of life" is a lot like "art". As in, "I don't know much about quality of life, but I know what I like." Since I can't really speak for anybody else's perceptions, I'll just say that didn't take me very long at Windward to be able to say "I like the quality of life here." Windward's cooperative approach to community living creates time for the people who live here. For example, time not spent cooking three meals a day is time I can spend doing something else. For me, that might be working on a novel. Or doing some online work for a client. Or playing guitar. Or working on one of my pet community projects for Windward. Or having a fireside conversation with other members of the community. I've lived long enough to learn that time is something I can't get enough of. I've also lived long enough to learn that the American Rugged Individualist Myth really just glorifies a sort of slavery. The fact is that cooperative groups of people can accomplish things that an individual just can't. 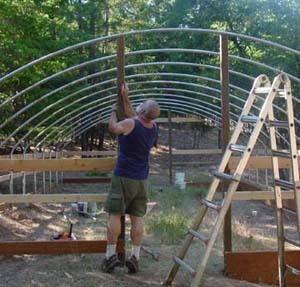 I say this as an avid, lifelong do-it-myselfer who for a long time wanted to be a modern "sustainable" homesteader. Seeing firsthand how much effort is involved in supplying water, energy, shelter and food, made it clear how much more efficient it is to be able to spread that effort among a number of people. In the Modern Urban World, getting things like adequate exercise and fresh air are, in effect, Extracurricular Projects. We have to make a special effort to get adequate exercise when most of our life is spent sitting at a desk inside an air-conditioned building or sitting in a car going to and from a job. And we may have to invest our hard-earned money to get this exercise. Not so at Windward. Fresh air and exercise are part of Daily Life at Windward. In my case at least, my "working for Windward" projects have all involved healthful physical exertion. 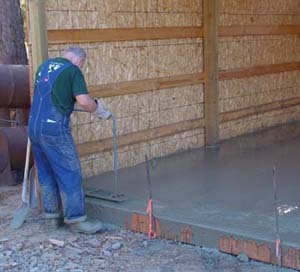 Splitting and hauling firewood, digging postholes for the Vermidise metal framework, running electrical conduit for the log cabin, loading hay bales from the farmer's haybarn onto the trailer and then into Windward's haybarn, working a wet concrete slab, framing and hanging drywall, weeding the kitchen garden, and lots more. I get in a good bit of walking, too. And no shortage of variety, as you can see. After my first month at Windward, I was definitely in better shape than when I started. And I didn't have to pay to join a gym or take an exercise class; I got my exercise doing something physically constructive that produced benefits for the whole community. And I did my share of cooking and cleaning up, too, but a lot less than if I was doing it all for myself. And my investment was in time was only a few hours every day "for Windward". Like a lot of Americans, I've spent much of my life involved with abstractions that took me further and further from the more tangible and down-to-earth aspects of life. Abstractions? Yes, abstractions like commuting two or more hours a day to a job I needed and worked hard at (but didn't necessarily love) so that I could pay to keep the car going (debt, interest, insurance, fuel, maintenance) and pay my rent or mortgage (and property taxes, maintenance, etc.) and the energy (and water and sewer and refuse collection) to keep the house comfortable and the food to feed my family and to pay the other taxes that keep roads paved and the government working. Et cetera, et cetera. You know the drill. Life in a more down-to-earth place like Windward is a bit more tangible and "closer to the earth". We grow, harvest and process an increasing percentage of our own food every year. We do most of our own construction and maintenance. Our water supply is from our own wells and we're getting close to generating our own electricity and expect to be able to feed some back into the grid. Since I've been here, nobody commutes to a job somewhere else. You get the picture. We don't pretend to be self-sufficient, but we're definitely working at being much more self-reliant in providing for the basic necessities of daily life. And, of course, Windward has invested in the tools needed for self-reliance, which makes achieving our mission of "modeling sustainability" possible. At the end of the day (literally as well as figuratively) being more self-reliant just feels better, at least to those of us who choose this sort of lifestyle. Doing all these things for ourselves is no slam dunk, of course. But there's a tangible sense of accomplishment at solving our own problems and building a community directly from the efforts of the "mission-motivated" people who live here. Of course, we're not the least bit opposed to technologies that make us more productive and efficient. There's no shortage of computers and such here. And we've got satellite Internet now, too, so we can be as "connected" as we choose. We're not Luddites; we know that it's human creativity, technology and economics that allows us to live this closer-to-the-earth sort of lifestyle without investing 12-16 hours of backbreaking physical labor everyday. Makes sense to me. In Part 2, I'll talk about some of the social aspects of the Windward lifestyle and also some of the wonderful things that are "missing" from life at Windward.